Bristol Sunset, a brand new residence with fine finishes, is located north of the island of Fuerteventura, in the center of the tourist resort of Corralejo, in the area called "Bristol Playa" a few steps from the historic pedestrian village, an evocative and characteristic place, above all in the evening, where you will find the main clubs and the best restaurants. Pool, gardens with sub-tropical plants and a panoramic chill-out terrace on the top floor equipped with Balinese beds, showers, a bar where you can order a cocktail with a splendid view of the island of Lobos and the Natural Park. Cozy and well-kept, the apartment on the first floor has a capacity of 4 people and consists of a double bedroom with quality mattress, living room with sofa bed and flat-screen TV, private bathroom with shower and bidet, fully equipped kitchenette : coffee machine with waffles (some welcome waffles included), washing machine, microwave, toaster, kettle, utensils and crockery. Bed linen and towels and beach towels are also available. Guests have at their disposal a safety deposit box, a weighing case, sewing kit. In the apartment you will find both in the living room and in the bedroom ceiling fans. Transfer to / from the airport can be arranged for a small fee. Cot, including linen, up to 2/3 years for hire. Lockers for storing rental sports equipment subject to availability. 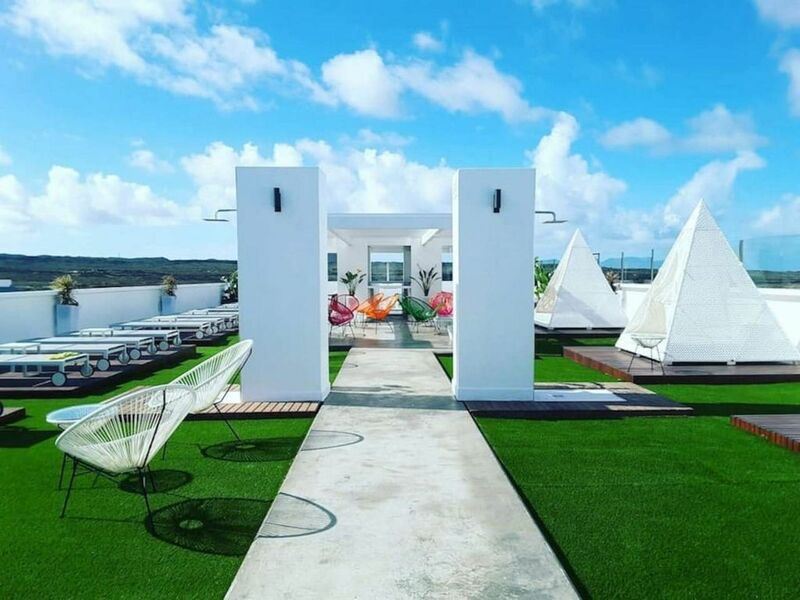 Chill-out area: with hammocks, Balinese beds, showers, services and a bar where you can enjoy magnificent cocktails while admiring a beautiful view of Corralejo and enjoying the sunset over the volcanoes and the sea. Coin operated communal washer and dryer. Check-in ore15 Check-out by 10.30 / 11 These times may change depending on customer's request. Lovely apartment, close to the sea and restaurants (although we got lost a lot, go you will too) food was excellent in most places (except the Angus steak house, near the Shell petrol stn). you really need at least ten days to suss the place out as it really is a warren. I am happy you had a great holiday! We started with a very handy pick up at the airport by Giorgio. Easy transfer and good information on buses, restaurants and general location on the way.The apartment is well equipped and comfortable. The complex is within the town so you need to expect a little night time noise, but it is ideally located near to the shore and an excellent range of restaurants, as well as a large supermarket. The pool area is quite small, but we loved the roof top bar and lounging area. Perfect for a cocktail at sunset! Very happy to recommend this apartment. Thanks Taylor I'm glad you had a pleasant stay in my apartment. I hope to see you soon again as my guest. Lovely appartment, great hosts and amazing location!! From first booking this appartment to the day I left, Sabrina was very helpful and swift in answering any questions I had! The appartment is ideal for 3/4 people with a double bed and a very comfortable sofa bed. It is fully equipped with any kitchen utensils needed if you fancy doing a bit of cooking and has a lovely balcony with table and chairs to then consume said food. Thanks to Sabrina, we were put in contact with the on site hosts Daniela who organised for us to be met at the airport by Giorgio who gave us a transfer to the appartment. Daniela and Giorgio could not have been more accommodating whilst on our trip and were full of local knowledge which was very helpful on our first trip to Corralejo. and beaches of Corralejo and any excursions (e.g. karting, zoo, boat trip) we went on offered free transfers from the appartment to the meeting points which was an added bonus! There is a great supermarket (superdino) just around the corner and has lots to offer! The only downfall to the appartment, which to be fair wasn't a big deal because there were fans, was that there was no aircon in the appartment which at night was a little uncomfortable. But with that being said, I would definitely recommend this appartment, Daniela and Giorgio and also booking with Sabrina!! Thanks for such a good trip!! Thanks Stephen for the nice review. I'm glad you enjoyed everything about your stay in my apartment. I hope to have you back as soon as my guest! stayed for 10 nights in February 2018 the apartment is very modern and spacious and is very well equipped, good facilities on the complex the rooftop chill out bar and sunbathing area is excellent and spent may evenings watching the sunset. Very close to bars restaurants and the harbour area and the bus station is just over the road which is ideal for exploring rest of island. Local agents Daniela and Georgio very helpful and airport transfer service offered by Georgio is excellent value,will definitely stay in this apartment again in the future. Thanks Paul for your positive recesion. I am happy that you have spent a peaceful stay in my apartment and that you enjoyed the residece and its comfort to reach the restaurants and clubs of Corralejo and the beautiful beaches. I hope soon to have you as my guests! Our apartment was very spacious and clean. Everything we required for a comfortable stay was there. All bars and restaurants close by . Our only problem was the street is very noisy with traffic due to a cash and carry opposite the complex. Climate fabulous an average of 20 ° in winter and 24 ° in summer. total in Fuerteventura there are 150 km of beach. Weekly market on Tuesdays and Saturdays. At the mall El Campanario: delicious Sunday market of crafts, ice cream shops, pizzerias, bars, clothing stores, art and a large supermarket. Corralejo Grandes Playas, equipped, 10 km long white beach, crystal clear water. Suitable for families with children. El Cotillo where you can find beaches for water sports like surfing, windsurfing, kitesurfing and a call La Concha beach of fine white sand and a few waves lambirla. To visit the Playas de Jandia with its 10 km of beach. Le tariffe sono soggette a modifiche fino alla conferma della prenotazione. Servizio navetta su richiesta 40€ a tratta. Possibilità di noleggio lettino per bimbi da pagare in loco. Possibilità di affittare un armadietto per depositare la vostra attrezzatura sportiva. Soggetto a disponibilità. Lavatrice e asciugatrice condominiale funzionante a monete.